I couldn’t call it The Hound (ugly) this week. The snow was pretty cool, and mesmerizing at times. –Winning. A Captain Obvious choice, but that game was a crap shoot going into it. The lake effect changed the game plan for both teams, and negated any real advantages. But, let’s face it, the Bills were fortunate to win that game. The Colts 2 point conversion near the end of the game was called back due to a pass interference penalty. A fortunate call, since it was within 2 yards of the line of scrimmage. It was a pick, but you see it often in the NFL. Couple that with The Punt 3.0 (more on that later), and the Bills snatched victory from the jaws of defeat and a tie. –Fans. Standing ovation for the Bills Mafia yesterday. –Cameramen. The men and women that worked the CBS cameras, and field level local media outlet cameras deserve credit for working through those conditions. 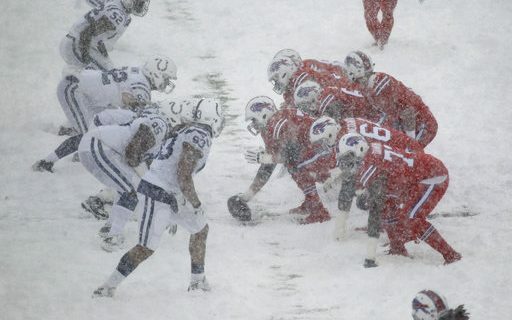 They captured one of the most memorable home games in Bills history. -Getting the Message. The Sabres got the message with the waiving of Matt Moulson, acquisition of Scott Wilson, and call up of Evan Rodrigues. The team responded with three straight good efforts resulting in a win, and two consecutive OT losses. That’s good for 4 points and respect. –The Punt. This was going to fit under the ugly portion of this, but the Bills won the game. Winning is not bad, but the decision to punt in OT at the opponents 41 yard line? That is still a bad call in my opinion. I can’t hate it immediately and post my disgust on Twitter during the game, and come back the next day and think no big deal. It was a big deal, and it’s still a bad decision. Sean McDermott’s explanation of pinning the Colts deep, forcing a punt for field position, and having the ball with the chance for a win proved to be true, but pretty risky for an otherwise conservative coach (read Paul Peck’s take on it here). He needed to win, not a tie. Going for it on 4th and 1 made all the sense in the world because of field position. He seemed to realize it too, by calling a timeout. We all figured, he came to his senses and was going to control his team’s fate. Nope. Still punted. There was no guarantee the Bills would get the ball back. None. But they did, got a great catch from Deonte Thompson, and walk-off TD run from LeSean McCoy for the win. McDermott doesn’t have to admit it being a poor decision. His plan worked. He won, and gets to be right, even though it was wrong. -Benjamin Hurt. Again. What is it with Bills WRs? The good ones anyway. They can’t seem to stay healthy. –Spero’s Blizzard. Spero Dedes kept referring to the snow as a “blizzard”. Wrong. Someone finally got in his ear and explained lake effect snow to him. Is this a big deal? When weather is the story of the game, better homework needs to be done. –Peterman Injury. That hit looked bad immediately. Slide next time. –Jack Eichel in OT. The $80 Million Man has struggled in OT this year. From not concentrating on Crosby in Pittsburgh, missing a penalty shot in Chicago, and now watching Tarasenko go end to end for the game winner in St. Louis (you could argue Kane should have had him). He’s got to better against the best to be the best. -If I were in marketing for the Bills, I’d be selling snow globes for Christmas with seat numbers on them for the fans that showed up for the game.